Any adaptation of a book can never truly replace the original work, but it’s often revelatory to experience a story in a new medium; it’s like seeing, if only imperfectly, through someone else’s eyes. 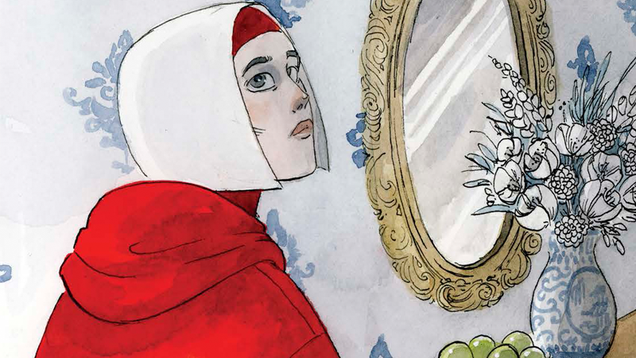 The rise of comics as a “respectable” medium is a case in point: Margaret Atwood’s 1986 dystopia The Handmaid’s Tale is receiving a high-profile graphic novel adaption this month, and it’s far from the first prose classic to be reinterpreted by noteworthy artists. These adaptations aim to honor and embellish rather than replace the books on which they are based—because how could they? In creating visual versions of classic works, the brilliant artists behind them allow us to see, literally and figuratively, the stories we love from new angles. Here are 8 book-to-graphic novel adaptations that serve as impressive companions to their source material. Almost a quarter century after its publication, Margaret Atwood’s The Handmaid’s Tale is having a moment: the TV series continues to widespread acclaim, and Atwood herself recently stunned readers with the announcement of a forthcoming sequel. More than any of that, the book’s themes of subjugation are at least as relevant and biting as ever, while its humanity has never been more essential. Artist Renée Nault has been collaborating with Atwood on this new graphic novel adaptation, telling the story through stunning watercolor art that captures the novel’s visceral emotional tone in a new way. Sixty years ago and today, we could all stand to consider and reconsider the lessons of Harper Lee’s To Kill a Mockingbird. Its themes of understanding and compassion are no less relevant or universal in 2019, and Fordham’s art honors the original novel while casting new light on the world of Scout, Gem, Boo Radley, and Atticus. Fordham visuals the book in a classic style that feels appropriate to a story of childlike reverie concealing undercurrents of racism, injustice, and heroism in a sleepy southern town. Walter Dean Myers’ complex 1999 novel follows 16-year-old Steve Harmon, an African-American amateur filmmaker awaiting trial for the robbery and murder of a bodega owner. The twisty-turny narrative explores issues of crime, race, and peer pressure as Steve documents his own circumstances in ways that leave his guilt or innocence—and even the notion of what it means to be innocent—up to the reader. This striking, monochrome take on the story adds an extra layer of complexity: it’s a visual adaptation of a novel about a young man who imagines his life as a movie. It’s tempting to imagine how we might have fared during the times of our ancestors: could we survive the past? Would we be welcome? For Black Americans, this is an idea that’s particularly fraught, and one that Octavia Butler explored in one of her earliest and most resonant novels. Dana, a young black writer living in California of the 1970s, is transported to the pre-Civil War South, where she encounters both the slaves from whom she’s descended and a white plantation owner who is also one of her ancestors. It’s a frequently harrowing exploration of the past’s lingering grip on our present and future. Duffy and Jennings’ award-winning graphic novel adaptation narrows the novel’s focus by emphasizing Dana’s struggle to save herself in a way that brings a renewed power to the story. Artist P. Craig Russell has collaborated with Neil Gaiman on any number of projects, including an earlier adaptation of the writer’s beloved fantasy Coraline. Here, the two are joined by the similarly accomplished Scott Hampton to tell the story of ex-con Shadow and Mr. Wednesday, a strange traveller who happens to be the Odin of myth. Russell and Hampton remain largely faithful to the original novel, bringing it to life with gorgeous artwork in this first of three volumes that will ultimately adapt the entire tale. The two are joined by several notable guest artists (including Colleen Doran and Walter Simonson) who provide art for flashbacks and side-stories in addition to alternate cover art. Lowry’s classic 1993 dystopian children’s novel introduces Jonas, selected to be the Receiver of Memory—a vessel for the thoughts and feelings of earlier generations—in a pharmaceutically control world that exists without pain and strife, but also lacking depth of emotion. The story has been adapted into a variety of formats, with varying degrees of success, but Russell’s art truly brings it to life, and includes important scenes left out of other adaptations. He makes excellent literal use of the novel’s concept of a colorless world, using color less and less sparingly as the story develops. The director of the 2008 Israeli animated war documentary Waltz with Bashir adapts the story of Anne Frank alongside that film’s art director, David Polonsky (the two also produced the graphic novel version of their quasi-documentary film). That art style is vivid, bright, and generally appropriate for kids, placing an emphasis on the comedy and charm of Anne’s telling of her life story, diving deep into her mind to recreate a teenage girl’s mundane world, then piercing it through with moments of incredible upheaval and horror. As in the original book, the unremarkable, day-to-day humanity of Anne’s story makes the injustice she suffered through all the more poignant—and universal. Cartoonist and writer Larson’s resume is peppered with varied and complex female protagonists, making her a perfect choice to adapt L’Engle’s cosmic coming-of-age story for its 50th anniversary. “Difficult” Meg Murry, her brother Charles Wallace, and their friend Calvin O’Keefe set out on a journey across universes to save Meg’s father and, ultimately, the world. Along the way, Meg matures into adolescence and faces conflicts filled with meaning and purpose. Larson’s blue-toned, soft-lined art never lets us lose sight of the human characters at the core of the wild adventure at hand. What’s your favorite book-to-graphic-novel adaptation? The post 8 Brilliant Graphic Novel Adaptations of Classic Books appeared first on The B&N Sci-Fi and Fantasy Blog. Just when you thought The Handmaid’s Tale couldn’t get darker, welcome to season 3.